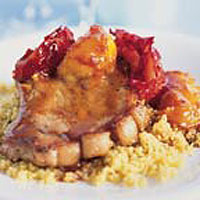 Juicy pork chops browned in sizzling butter, then simmered with sweet plums and ginger make a sensational supper. Make several cuts into the fat of each chop to help it crisp. Season well. In a bowl, coat the plums in sugar and ginger. Heat the oil and a third of the butter in a frying pan on a medium heat. Allow the butter to foam, add the chops and cook for 5-6 minutes on each side until golden. Add the plums and any juices. Cook for 2-3 minutes until the plums are soft and the chops are cooked through. Pierce the chops with a skewer: the meat is cooked when the juices run clear. Leave half the plums in the pan. Place the rest with the chops on a hot plate and cover to keep warm. Add the wine or apple juice to the pan and bring to the boil, stirring. Simmer for 4 minutes to reduce by half. Turn off the heat, add the remaining butter and stir until melted. Season to taste and serve with the chops and some couscous, such as Waitrose Lemon and Garlic Couscous.